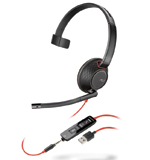 Plantronics Blackwire 5210 USB monaural (single ear) equipped with both USB-A (regular USB) and 3.5mm smartphone/mobile device connector. Ideal for users who needs PC and multimedia communication. Plantronics Blackwire 5210 is very comfortable with leather ear cushions, ergonomically designed with functional controls. * Built for UC applications and softphones from Avaya®, Cisco®, Microsoft® and more. * Both 3.5mm smartphone and USB-a (regulard USB) connection.